Saving money is tough. Thanks to online shopping, people don’t even have to get out of bed to squander their monthly salary on whatever strikes their fancy. And the popularity of digital money, rather than hard currency, has made it even easier to spend than ever before. What to do? Well, you don’t need to be pursuing an accounting degree to realize that sound personal finance starts with everyday matters, so the first step may just be to get a good wallet. Sound too dull? Think again, as these days a good wallet is more than just a simple leather case in which to keep cash. We’re talking about radio frequency identification (RFID) blocking technology, waterproofing, and even a savings-maintaining hinge that users have to fight with tooth and nail in order to get their own wallet open. In the digital age, people need a 21st-century, technologically current wallet. With that in mind, here’s a look at ten of the most amazing and geekiest gadget wallets we could find. And most of them, at least, won’t break the bank should you choose to buy one. The Attacoa Performance Wallet by Toner Machining Technologies is durable inside and out. With its sturdy protective polymer casing, it’s the Boy Scout of wallets. Going hiking? 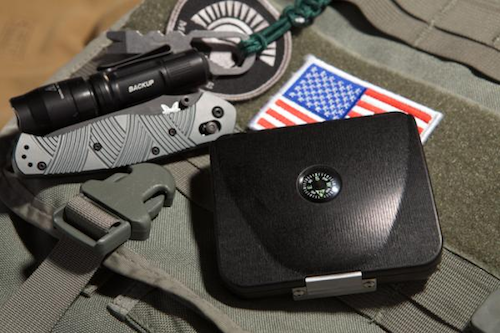 The wallet comes with a built-in compass, and it also features handy inclusions like a pen, a toothpick, tweezers, a striking edge, and removable money clips. Heading for a swim? The Attacoa Performance is waterproof and light enough to float. 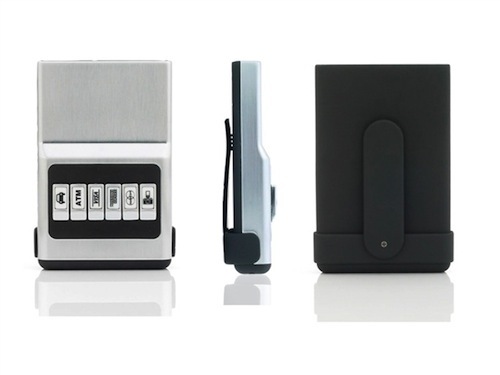 What’s more, it resists RFID scans, helping prevent card information from being stolen by portable RFID scanners. The wallet also has two secret compartments for storing small important items – like spare keys, or some aspirin for those post-hiking aches and pains. 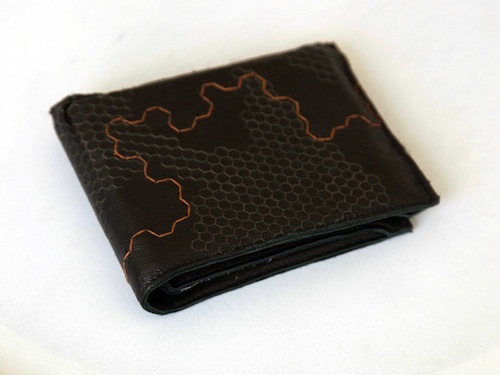 The Attacoa wallet is 4 inches wide, 3.57 inches high and 1.15 inches deep, and it sells for $89. Designed by U.K. inventor Gregory Venters and made in Scotland, the Omega wallet makes a perfect money holder for someone who wants the benefit of RFID data security. It can carry a maximum combination of ten cards and five bills between its two metal plates. 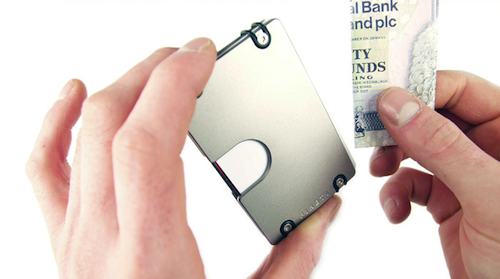 Users access the cards and cash by squeezing one of the metal plates and sliding them out by means of the finger slot. The Omega wallet comes in two models – aluminum and titanium – but both protect the RFID data stored on credit cards. The wallet also works as a handy bottle opener. However, unlike the tougher titanium model, the less durable aluminum version can be subject to the wear and tear of cracking open beverages. Gadget sites are flipping out over the Flipside 2X wallet’s slim and sleek design and its neatly compartmentalized interior. As well as offering easy organization and rugged protection for people’s valuables, the wallet can fit up to seven credit cards in three card compartments – while another compartment flips over to reveal enough room for an additional 12 bills. The Flipside 2X’s durable polycarbonate construction stops credit cards from getting bent or otherwise warped, and the wallet provides RFID card protection, too. Its tough locking mechanism means cards and cash are kept safe and secure, and its svelte design makes it easy to slip into any pocket without unnecessary bulkiness. 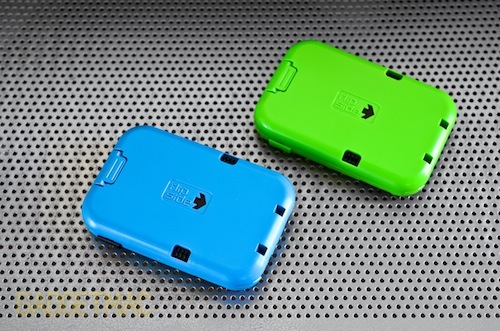 The Flipside 2X costs $39.95, which saves plenty of cash to be stashed inside it. Any accountancy practitioner would be proud. 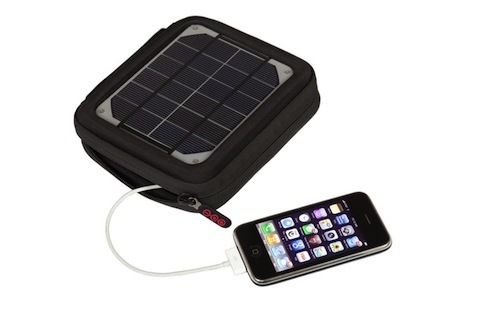 It’s easy to look on the bright side with the Voltaic Amp Solar Charger wallet. Unlike most wallets – which are generally just used for storage and protection – this one has the capacity to recharge electronic devices. According to Voltaic, the wallet boasts double the battery capacity and quadruple the power of other similar solar-powered chargers. So this little powerhouse clearly packs a punch – and it also needs only nine hours of direct sunlight to fully charge. It is compatible with everyday devices, including smart phones, digital cameras and tablet devices. The two-watt panels are waterproof, too. And if that’s not enough, the wallet is made using recycled soda bottles, which makes it light and able to withstand ultraviolet light. With its price of $99, some might say it would be dim to be caught without one. The Auto Card Manager (ACM) is roughly the size of a deck of cards. However, unlike automatic card shufflers, it instantly spits out the exact card being sought. 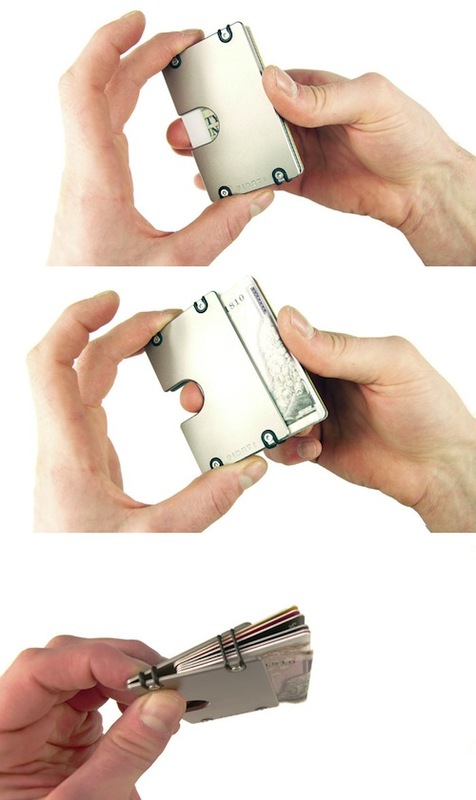 The wallet uses a locking mechanism to hold up to six cards in place. And the press of a button releases the corresponding card, with each button displaying one of 18 available icon options. There’s also a money clip on the outside of the wallet that can hold about 20 bills. The ACM is available in four different color models: All Silver, Hybrid Black, Hybrid Blue and Hybrid Pink. The original All Silver model boasts RFID shielding as well, helping protect the user’s cards. Furthermore, there’s a chunkier 12-card Hybrid Black version. The only drawback for those purchasing the ACM is that it’s not made to withstand a person’s body weight, so it can’t be put in a back pocket and then sat on. The wallet and the cell phone have finally gotten hitched, thanks to the technology of the iWallet. Now they’ll never be more than 15 feet apart. Why? Because with both devices linked via Bluetooth, an alarm goes off if they lose contact with each other. With secret agent cool, the iWallet also uses a biometric fingerprint reader locking system to ensure the safety of the user’s valuables. 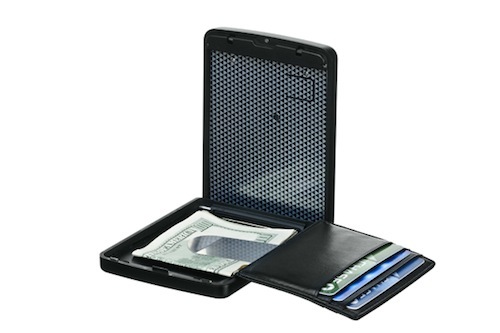 Plus, the inside of the case includes a neat cardholder as well as a money clip. Engineers who have worked with NASA designed the iWallet, and its futuristic biometric security system explains the hefty price tag of $459. And that’s for the classic Aluminum Slim model. The Carbon Fiber Classic model costs $599. Proverbial Wallets are like silent mother hens – until they think the owner’s spending is getting out of control. The idea behind the wallet is that a quiet “tisk tisk” from a discerning neutral bystander will help consumers control their spending – which should definitely help when it comes to balancing the books. Using Bluetooth technology, the wallet connects with users’ bank account information. The Proverbial Wallet comes in three models: Bumblebee (pictured here), Mother Bear, and Peacock. The Bumblebee wallet vibrates, or “buzzes,” every time a withdrawal is made. Meanwhile, the hinge inside the Mother Bear wallet takes a bit of effort to open, perhaps metaphorically reminding users of the effort it required to make the money in the first place. Lastly, the Peacock wallet mimics the male peacock, which uses its dazzling feathers to show off and attract mates: based on this idea, the wallet expands or contracts depending on the person’s bank balance – showing that sometimes size does indeed matter. Is it a bird? Is it a plane? Is it… somebody dancing clutching their Superman ladies wallet? Yes it is. 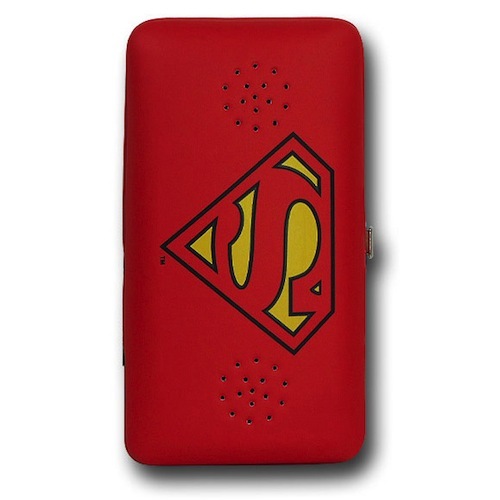 This Man of Steel-themed wallet screams geek with its built-in speaker and comic book salute to Superman. The red and yellow accessory features a headphone jack and a slot for two AAA batteries on the inside to get users grooving. There’s room for all a person’s cards as well as a small pocket to keep their change safe as they dance around the world enriching otherwise dull nights, like some kind of party-saving superhero. All of this for only $28.99. This wallet is made down under in Sydney, Australia, and unlike the case with most of the wallets on this list, there’s no need to be alarmed if it happens to find itself down under – water, that is. Yes, the Dosh wallet is completely waterproof. It’s also made of non-toxic water-resistant polymer material, so it can withstand most environments – including those wet and wild trips to the water park. Designed by Henri Spaile and Mark Armstrong, the wallets are made from 100 percent recyclable material and don’t contain any animal products. 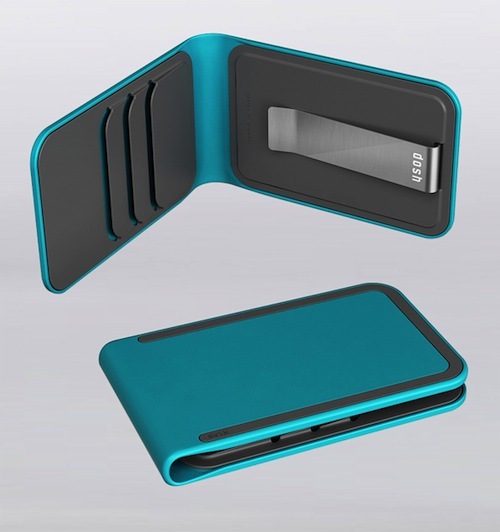 There are several options to choose from, differing in color, the number of card slots, the placement of the money clip, cost, and other features. Dosh wallets range in price from $49.95 to $79.95. The I Wallet (not to be confused with the previously mentioned iWallet) offers people a unique way to eliminate carrying bulky photo albums around. At first glance, it looks a lot like a standard leather wallet, but a closer inspection reveals the true nature of the tech-savvy I Wallet. 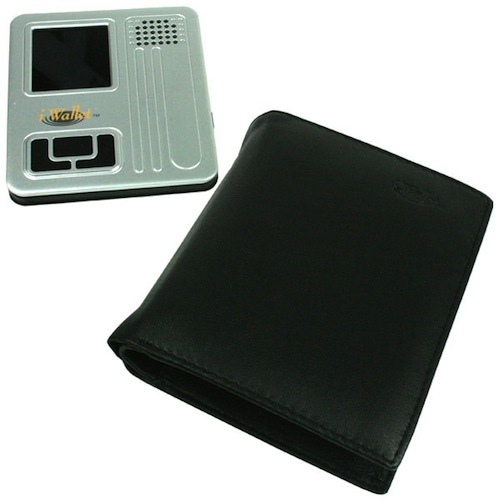 Essentially, it’s a portable mini digital photo album that also allots room for the user’s cash and important cards. With a 160-megabyte internal memory, the wallet can store as many as 56 pictures and a 140-second audio message. Images can be uploaded onto the I Wallet via a USB cable from any computer. Additionally, there are slots in which to store important cards, as the user peruses photos of pals on their trendy I Wallet device.